Growing up in the Houston area, my family spent many Summer getaways in Galveston…sand, surf, and fresh Gulf seafood were all we needed for a great time. My maternal grandparents had a beach house on Galveston during my childhood, so the island was sort of a home-away-from home. As adults, Michael and I still love to visit Galveston! This Summer, we enjoyed a pair of island getaways. Michael and I took part in an invitation-only overnight preview cruise of Royal Caribbean’s refurbished Navigator of the Seas. I’ll tell you about that fun experience tomorrow! Today, I want to share a Galveston Family Fun Day that we enjoyed with our teenage niece and nephews. Lili, Wolf, and Levi live in Ohio...so we don’t get to see them very often. They spent a few weeks at my parents’ house in the Houston area this Summer, so Michael and I put together a fun day trip. 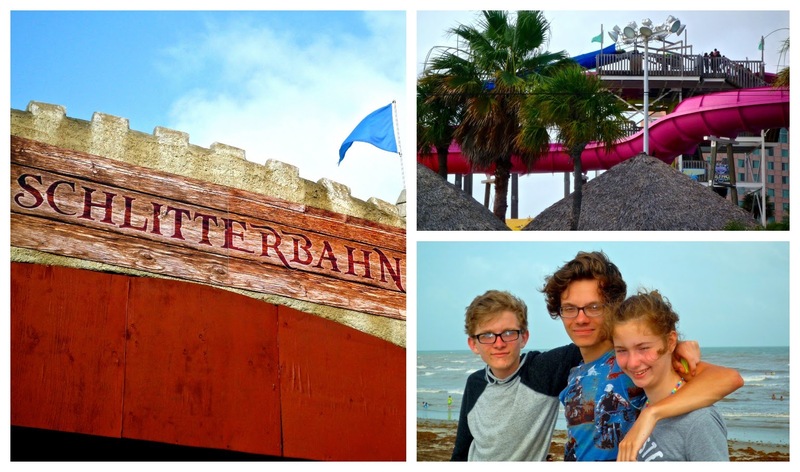 Our visit to Galveston included a day at Schlitterbahn Waterpark and a seafood feast at Joe’s Crab Shack. Schlitterbahn Galveston is an offshoot of the iconic New Braunfels waterpark of the same name. We had a busy, fun day -- complete with requisite sunburns! When Levi was little, we all lived in the Houston area…so Aunt Wendy and Uncle Michael took him on playdates that became known as “adventures.” So, this Galveston trip is the most recent in a long line of adventures that we’ve shared over the years! Our island adventure started in the morning with a quick pit stop to pick up bottled water and snacks. Schlitterbahn has a budget-friendly policy that allows guests to bring coolers inside the park and keep them in a designated covered area filled with communal picnic-style tables. We brought fruit, big bottles of water, and a few other goodies in our cooler. If you prefer to purchase food inside the park, there are 12 different restaurants and snack bars that serve casual food and snacks. We started our Schlitterbahn visit by dropping our personal items in the convenient, secure locker area. Once we applied copious amounts of sunscreen, we hit the water! We had a blast hanging out in the wave pool...and floating around the extensive river complex that circles the park. The price of admission includes the use of lifejackets and inner tubes. Some inner tubes were for one person, and some were for two people to share. We spent hours floating around on the river...some portions were calm and serene, but there are two offshoots for the more daring. One section of the mile-long river complex features huge rolling waves that toss you around on your inner tube. Another offshoot features simulated white water rapids. Both of these high-adrenaline sections were really fun – even for the less adventuresome of our group. We spent the bulk of the day until the late afternoon hanging out on the river and riding some of the water slides located around the park. We encountered a few lines, but we were pleasantly surprised at how quickly they moved. The longest time we had to wait for any slide was 15-20 minutes. By late afternoon, our stomachs were growling, and we were ready for a break from the Summer heat. Joe’s Crab Shack to the rescue! 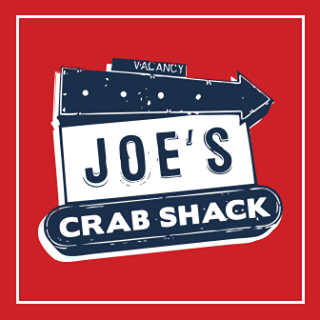 The Galveston location of Joe’s Crab Shack is on the Seawall, overlooking the Gulf of Mexico. Because of its beach location, the relaxed dress code encourages casual beachwear. We simply slipped shorts and t-shirts over our bathing suits, combed our hair, and put on some sandals. Voila – we were ready to eat! Schlitterbahn has a convenient in-and-out policy that allowed us to leave the park to eat…then return for more water-based fun the rest of the evening. This was very convenient, as well as customer friendly! We arrived at Joe’s Crab Shack and were welcomed by the friendly wait staff. They immediately brought us icy drinks to sip while we looked over the menu. 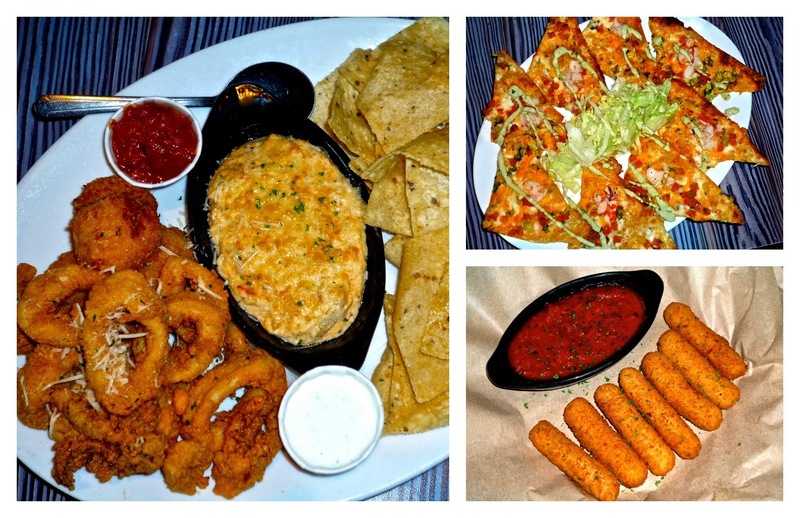 They brought out a few of their signature appetizers for us to try: Mozzarella Sticks, spicy Lobster Nachos, and a Classic Sampler. The sampler contained a trio of appetizers: crispy calamari, creamy hot crab dip, and Great Balls of Fire (cream cheese, seafood, and jalapeños breaded and fried). Everything tasted fabulous -- the pickiest eaters at our table found something to enjoy. Even those who hadn’t tried calamari before bravely tried it…and everybody gave it a thumbs up! 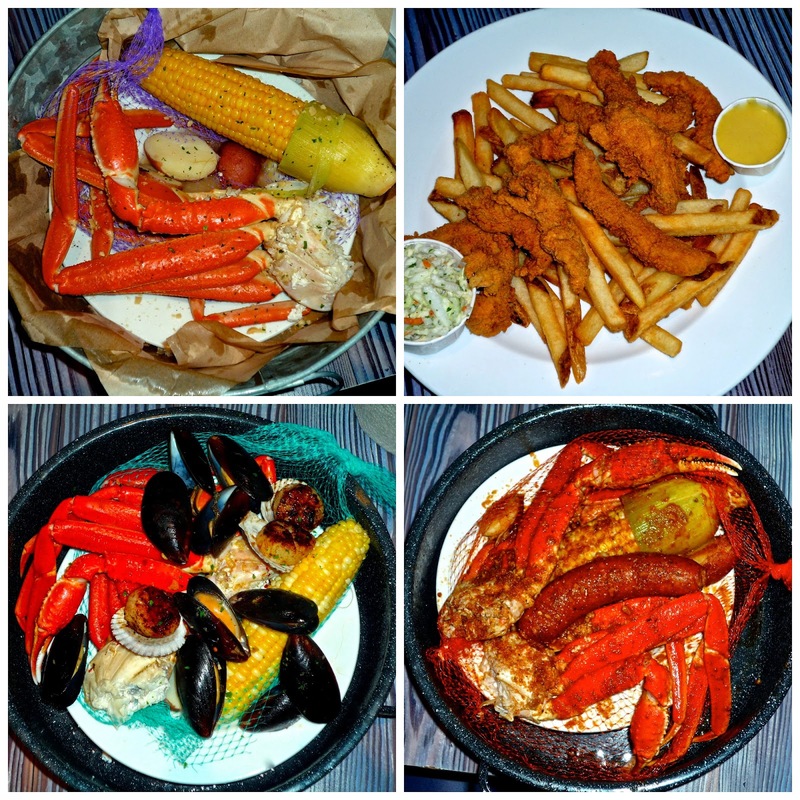 For our entrees, we shared a trio of signature Joe’s Crab Shack Steampots. They're all-in-one meals that include seasoned steamed seafood, corn on the cob, and potatoes. We shared Joe's Classic Steampot, the KJ Steampot, and the spicy Ragin' Cajun. The Classic contained sweet Snow crab, shrimp, and sausage. The KJ contained Snow crab, mussels, and seared scallops in a Kendall-Jackson wine sauce flavored with garlic and citrus. The Ragin' Cajun combined Snow crab, Queen crab, shrimp, and andouille sausage...all sprinkled with a spicy Cajun seasoning. This variety truly offered something for everyone. For the non-seafood lovers, they sent out a platter of perfectly fried Homestyle Chicken Tenders. 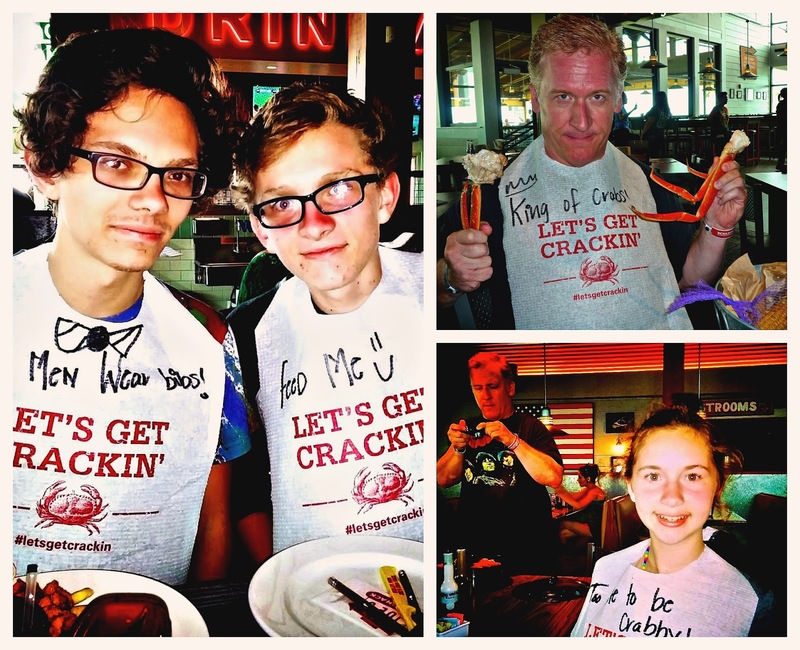 Since eating crabs can be a very messy endeavor, we all put on our disposable bibs and got cracking -- literally. If you're a novice crab eater, no worries...the helpful waitstaff will help get you started. Before we knew it, we felt like crab cracking experts. Joe's Crab Shack writes funny sayings on each bib before they help you put them on. Everyone wears them, so I promise you won't look silly. Michael was crowned King of the Crabs, an honor that he was quite proud of! Everyone in our group loved the food at Joe's Crab Shack…and there was more food than even two hungry teenage boys could devour. That, my friends, is saying something! 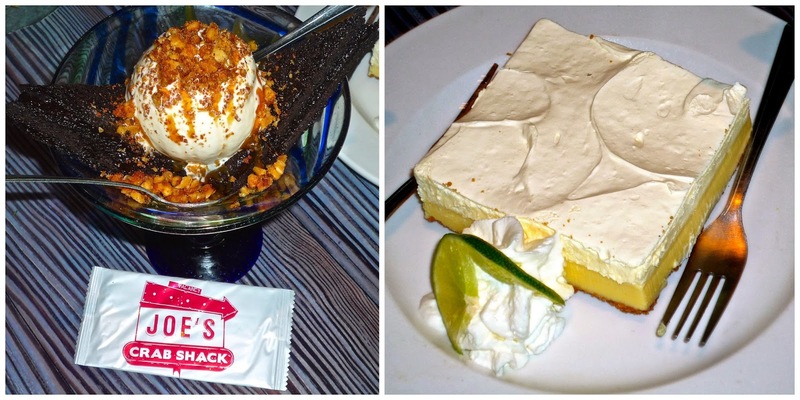 For dessert, we shared two sweet treats from the dessert menu: Sea Turtle Sundae and sweet-tart Key Lime Pie. Both were creamy and delicious, and the portions were perfect for sharing. The wait staff at Joe’s Crab Shack keeps the fun going, that’s for sure. Every few minutes, they put on music and dance around the dining room...they had Lili and Wolf up on the floor dancing right along with them! We left Joe's Crab Shack full and happy…and ready for another couple hours of evening fun at Schlitterbahn. We arrived back at Schlitterbahn as the Sun was starting to moderate a bit. Parking is included in the ticket price and includes convenient in-and-out privileges. We decided to spend the rest of our time before closing hanging out together on the floating river complex. We had a blast linking our inner tubes together -- in a circle...in a train…and even in a snake -- amid the waves and rapids. We laughed and laughed, making enough memories to last until the next time we’re all together again. Family memories like the ones we made that day are truly priceless! Before we knew it, the Sun was setting…and the park was closing. We gathered up our stuff and headed back toward our car. Schlitterbahn Galveston's schedule varies depending on the season. The waterpark is open year-round -- except for a few weeks in January and February. After Labor Day, the park is mainly open on weekends. From mid October through January, the park holds its Heated Indoor Season. During that time, one covered section of the park is open during the daytime -- and the water is heated. That lets the fun continue long after Summer is officially over! If you're visiting Galveston, Schlitterbahn tickets can be purchased at the gate, or they can be pre-purchased online. Disclosure: Schlitterbahn Galveston provided our group with complimentary admission to the watermark. Joe's Crab Shack hosted our meal to facilitate inclusion in this article as well. All opinions expressed are my own.